Editor’s note: This column is part of NMID’s weekly newsletter. Sign up here. I’ve always loved that analogy from Supreme Court Justice Louis Brandeis that “states are the laboratories of democracy.” I like the notion that great ideas and different ways of doing things can bubble up from the bottom and change the way the world works. I was a young copy editor in San Jose, California, when a former roommate told me I should try this great new search engine, “Google,” to look for things on the internet. (OK, I can’t help myself. Here’s my favorite claim to fame: Google guys Larry Page and Sergei Brin were in my living room for a house party in the ‘90s. Hey, they were geeks back then, not gagillionaires.) The Silicon Valley mythos is rife with garage-to-Googleplex stories about people and companies that have changed the world. So what does that have to do with New Mexico? Because New Mexico always gets the bad rap that it never tries anything different. That its default position it the status quo. And as a result, it stays mired in 50th place in everything. But since I’ve been covering early childhood education in New Mexico, I’ve met a lot of people who are trying different things. Experimenting. Making things work for their own communities. Children at the Bright Beginnings Child Development Center gather at the family style tables to eat lunch. 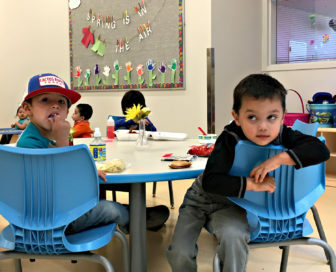 Because the center is so new, parents need to pack or bring in food for the children, but the directors are applying to become a part of the state’s food program. Case in point is Jal, New Mexico. This is a small, bustling oil and gas town near the border of Texas in southeast New Mexico. It has a little over 2,000 souls, though it’s growing with the fracking boom. Parents there had few alternatives for childcare. They might be able to hire a nanny. If they were lucky, they had parents or relatives who could take care of their children. But a licensed provider or childcare center? Nope. After getting continuous calls from parents asking where they could take their children for preschool or child care, teachers at Jal Elementary decided to look into how they could provide those services right there at the school. It took some doing, because the model they were proposing — a Children Youth and Families regulated and partially financed childcare center housed in a Public Education Department-funded public school had not been tried before. Give credit to the Martinez administration that — after just a bit of hesitation about the logistics — they found a way to make it happen for the two-school district. Bright Beginnings co-director Jamie Galindo had nothing but praise for the help the school got in opening the center from a private foundation, CYFD and PED. Not only did the center give parents a high-quality child care option, but it also gave job opportunities to several women in Jal — most of whom are mothers, Galindo said. There’s cool stuff going on in Roswell, too. I wrote last week about a group of educators there who are taking a systematic approach to expanding early childhood education. They have a tough time recruiting teachers, so they are also taking the long view and building a homegrown education workforce. Just this week, Jennifer Cole, the leader of this coalition of the willing and able, tells me that she’s hired preschool teachers for all the new neighborhood school slots Roswell Independent School District received from PED, though she still needs teachers for three classrooms at the district’s Parkview Early Literacy Center. Meanwhile, here in my hometown, the former Head Start director who now heads federal programs at Las Cruces Public Schools, is finding ways to put New Mexico PreK and Head Start classes in the same schools without poaching students from Head Start and sending valuable federal dollars back to D.C. It’s something state analysts have been saying needs to change. It’s heady times in early childhood in New Mexico. I’m interested in seeing what else people on the ground are thinking up. If you’ve seen some smart solutions, drop me a line at sulloa@nmindepth.com. Amber Wallin is all about the numbers. After all, she manages New Mexico Voices for Children’s annual Kids Count databook and oversees the organization’s research and policy work.